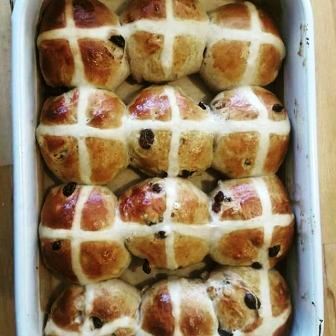 We love breadmaking as you’ve probably guessed and this week we’ve been hot cross bun-ing as it’s the Easter weekend. We made some gorgeous off piste ones with chocolate, orange and Cointreau and another batch with pistachio and lemon but sometimes you’ve just got to stick with the classics which is what David made for Good Friday’s breakfast tomorrow. Can’t wait – warmed through with homemade marmalade and great coffee; gert lush as some people say round these parts! If you’d like to try them out, here’s the recipe – let us know how you get on and Happy Easter. 1 roasting tin approx 30cm x 24cm (12” x 10”) lined with parchment paper. 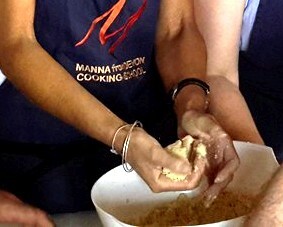 Bring all together and mix well in the bowl then turn out onto a work surface and knead for about 10 minutes. This mixture will definitely be sticky to start with but resist the temptation to add more flour. It will be smooth and dry enough to handle easily by the end of the kneading. Place into a bowl and leave to rise in a warm place covered with a plastic bag or tea towel until doubled in size. This may take up to two hours so be patient. Once the dough is fully risen turn it out and knock back, incorporating the rest of the ingredients of your chosen flavour. Divide into 12 even pieces and shape into balls. Place these in a 3 x 4 arrangement in the lined roasting tin. Meanwhile make a paste for crosses by mixing 2tbsp of plain flour with a pinch of sugar and enough milk to make a thick paste. Put this into a sandwich bag. Preheat your oven to 190C. When the buns are risen and soft to the touch brush with egg wash then snip the corner off your sandwich bag and pipe on crosses to each bun. Bake for about 15-20 minutes until a skewer pushed into the bun comes out clean. Cool on a wire rack then brush with sugar syrup.